So Embarrassed! | Have Fun With It! ← Jumping out of my comfort zone! During dinner one evening I decided to be bold. We ate cafeteria style and after I picked up my food and went to sit by the visiting illustrator Henry Cole. He was sitting near a window speaking to another woman and I sat next to her. She gave me a bothered look when I sat down. While I ate the table began to fill up. On my right another woman sat next to me I hadn’t seen before. I asked her if she was visiting and she said yes. I tried to be brave and make small talk so I asked if she was a writer. She said yes she was. I asked her what she liked to write. (This was the common lingo as we sat in random spots each meal and met people, asking how long they had been in the writing program.) She said she liked to write middle grade. I asked her if she had graduated from the program and she said No. I than asked her if she would like to come here someday and was she here inquiring about the school. By now everyone at my table was quiet, listening in on our conversation. Some were smiling and some were quiet. Henry Cole was kind of shaking his head at me. I then whispered to him if the people on this table were famous and he nodded. 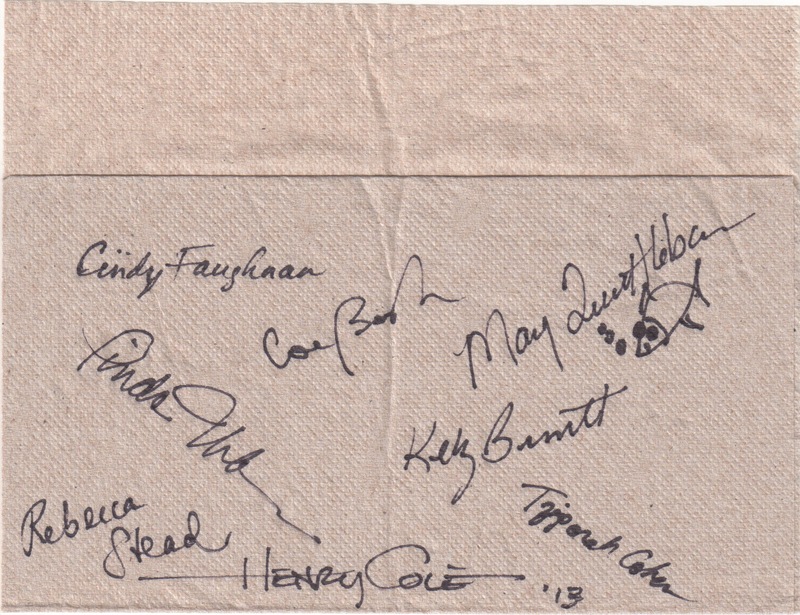 I then said, should I get autographs with my napkin, and he nodded again. I said I don’t have a pen. He pulled a pen from his pocket and took my napkin and placed it next to the lady to my left who didn’t want me to sit next to her. She signed. Then he signed, then he went all around the table asking people to sign the napkin. The lady I was making small talk with signed. My advisor, author Mary Quattlebaum signed, and a few students signed. We all kept making small and talk and then we left to go to the next meeting after dinner. As we were sitting in the large chapel, an instructor got up to introduce the visiting author of the week, the special guest and Newbery winner Rebecca Stead. The woman sitting on my right that I asked if she was inquiring about being a student at the school…she got up and began to speak. I wished I could turn into Flat Stanley and disappear in between the slats in the wood floor! During the rest of the week she met with individual groups to give instruction on writing. I met with her for lunch. She was lovely and kind. But I was so embarrassed for not knowing who she was when everyone else did. This entry was posted in My Thoughts and tagged embarrassed, famous illustrators and writers for children, Newbery winner. Bookmark the permalink. 1 Response to So Embarrassed! That’s pretty funny… One day kids are going to be asking you to sign there napkin!